How to show the confirmation dialog box while save the records in Normal EditMode? We can show the confirmation dialog box while save the records in Normal EditMode using actionBegin event of the Grid. In the actionBegin event we have rendered the ejDialog as like confirmationDialog with ok and cancel button and save the records using endEdit method of the Grid. The following code example demonstrates how to show the confirmation dialog box while save the records in Normal Edit Mode. 1. Initialize the confirmation DialogBox and render the Grid with actionBegin event . 2. In this actionBegin event of ejGrid, we have check the condition with requestType as save and display the confirmation dialog. 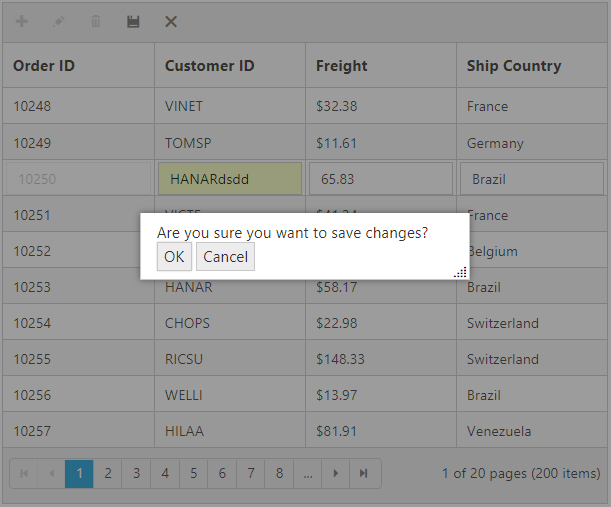 In confirmation dialogBox we have bound two ejButton as Save and Cancel. When we click on Save button we have saved the record in Grid using endEdit method of ejGrid and when we clicked on cancel button we closed the confirmation dialog.